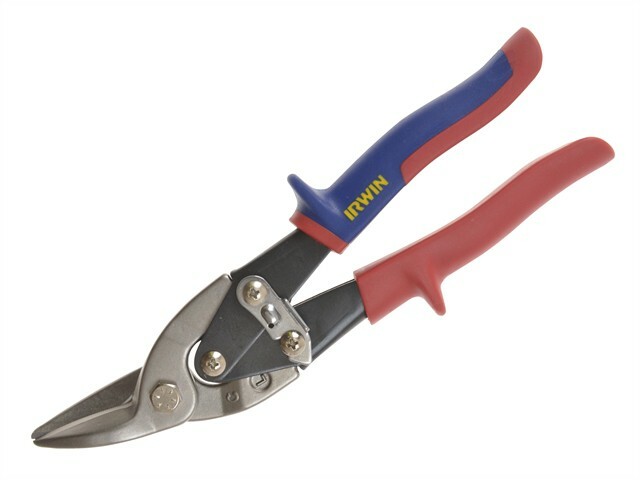 Irwin Aviation Snips have precision-formed blades that are cold formed meaning that the blades are stronger for an extended cutting life, require less cutting force, and provide a longer cut per stroke. The optimised torsion spring gives a consistent and smooth operation with increased reliability and durability. The safety latch is comfortable to reach from handle position with an easy push-up and release and one-handed opening and closing. The lower blade is serrated, providing more grip and a smoother, consistent cut with no double marked edges. The high-strength alloy steel spines can sustain greater pressure for cutting tougher materials and give increased life. The compound cutting action, reduces force needed to cut and decreases hand fatigue. The solid over-moulded soft-grips give superior comfort and performance.